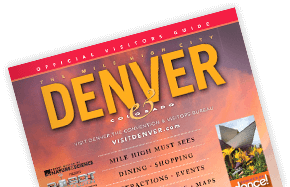 Discover why The Mile High City is the place to be when it comes to incredible arts and culture. Eyes On is a multi-year art series at Denver Art Museum that features the work of contemporary artists. Minnesota-based Julie Buffalohead, a citizen of the Ponca Tribe of Oklahoma, often uses animals in her artwork to illustrate the commercialization of American Indian culture. Whether depicted as faithful companions or threatening adversaries, animals have been the subjects of human art for centuries. Stampede allows visitors to consider the roles animals play in our lives and in our art through more than 300 paintings, sculptures and more at Denver Art Museum. Renowned painter Georgia O&apos;Keeffe&apos;s influence is evident in the work of several generations of artists, and this exhibition at MCA DENVER — Museum of Contemporary Art Denver brings together a select group of them. In his first solo museum exhibition, Andrew Jensdotter, who completed his MFA at the University of Colorado at Boulder in 2014, showcases his unique "carved paintings" at MCA DENVER — Museum of Contemporary Art Denver. These works are painted in layers over a series of months and then cut to create a variegated field of abstract color. Denver-born artist Jordan Casteel chooses her subjects by walking around her neighborhood in Harlem, New York, and taking photographs, which she then translates into larger-than-life portraits that reveal individuals and atmospheres that often go unnoticed. See Returning the Gaze at Denver Art Museum. It&apos;s been 500 years since the death of Leonardo da Vinci, but the Renaissance man&apos;s legacy lives on. View dozens of Leonardo’s inventions at Denver Museum of Nature & Science, including an automobile, helicopter, airplane, submarine and military tank; test a Leonardo-inspired catapult; and explore the world&apos;s only 360-degree replica of "The Mona Lisa." Stroll through an insect nursery of larger-than-life cocoons and larva sewn by Denver artist Nicole Anona Banowetz. Children and adults alike can also contribute to the life cycle of the nursery by designing their own creature to add to this ever-evolving exhibit at Denver Art Museum. This multi-media installation at Denver Art Museum by Mexican-American artist Erika Harrsch is comprised of imagery, music, text and furnishings that reference the circumstances faced by immigrants and refugees subject to the United States DREAM Act. The Bauhaus school of art and design in Weimar, Germany, was only open for a few years before the Nazis forced it to close. To celebrate the 100th anniversary of this influential art style, the Kirkland Museum is highlighting Bauhaus pieces from its permanent collection, including many not usually on display. Treasures of British Art: The Berger Collection features more than 60 paintings by masters such as Anthony van Dyck, Adriaen van Diest, John Singer Sargent and Thomas Hudson, gifted to the Denver Art Museum by the Berger Collection Educational Trust. The Ute are Colorado&apos;s longest continuous residents. In History Colorado Center&apos;s Written on the Land, you&apos;ll journey to the places they call home and hear their stories, told in their own voices through art, photography and video. "Liminal space" refers to a transitional or transformative space. In this exhibition at Museo de las Americas, you&apos;ll witness how local Latino artists are taking their knowledge of the traditions of the past into this liminal space and transforming them into new cultural interpretations and identities. Barbara Locketz studied under Vance Kirkland at the University of Denver and later taught there herself. She works in a variety of mediums, including oil paintings, prints, collages made from paper and metal, acrylic and metal sculpture, textiles and jewelry, and exhibits her art across the American Southwest, New York and Mexico. Now that list also includes the Kirkland Museum of Fine & Decorative Art. This powerful and timely exhibit at History Colorado Center explores the concepts of home and borders and features artists from southern Colorado, northern New Mexico and beyond. Human | Nature&apos;s 18 sculptures depict the expressive capacity of the human form against the backdrop of Denver Botanic Gardens&apos; lush botanical environments. The collection includes both classical and abstract pieces from sculptors across the globe. Artist Patrick Dougherty weaves flexible, sustainably harvested saplings into complex and whimsical architectural forms with the help of staff and volunteers. The installations remain on view at Denver Botanic Gardens Chatfield Farms until they naturally fall apart, some lasting for years! This unique Denver Art Museum exhibit presents the concept of playfulness in postwar America as a catalyst for creativity and thoughtful design in everything from home furnishings, to children’s toys, to corporate offices. Artist Jonathan Saiz uses social media to spark conversation about our society&apos;s ability to embody a modern utopia: "an imagined community or society that possesses highly desirable or nearly perfect qualities for its citizens." His installation #WhatisUtopia at Denver Art Museum is a column covered with 10,000 minuscule drawings, paintings and sculptures, all created to be given away after the end of the exhibition. Follow along on Instagram via @utopia_is_free or using the hashtags #WhatisUtopia or #JonathanSaizatDAM. The Light Show at Denver Art Museum features more than 200 objects drawn from the museum&apos;s nine curatorial departments that explore both physical and symbolic representations of light in art. Claude Monet: The Truth of Nature is the most comprehensive exhibition of Monet paintings in the United States in more than two decades, featuring more than 100 paintings spanning Monet&apos;s entire career. And it&apos;s coming to Denver Art Museum! This exhibit focuses on the renowned impressionist&apos;s relationship with nature as he traveled across Europe, including the landscapes of France, the Mediterranean, London, Norway and the Netherlands.